I’m sitting in the outdoor veranda of an upscale café, sipping a perfectly made cappuccino and digging into a vegetarian quesadilla for lunch. It’s a pleasant 70 degrees and sunny, and all around me, young entrepreneurs are lost in their work – coding, tweaking UI designs, excitedly discussing business ideas with peers. At first glance it’s San Francisco—except that we’re 9,586 miles away, in Nairobi, Kenya. This summer, I’m interning at Ushahidi, a non-profit technology company that uses crowdsourcing for social activism and public accountability. The company was one of the first to use “activist mapping”—a combination of citizen journalism and geospatial information—to allow citizens to submit reports using their mobile phones or the internet to create a map-based account of events. Among other things, the platform has been used to monitor election violence in Kenya, disaster response in the Haitian earthquake, and collect eyewitness reports in Gaza and Somalia. During my first year at HBS, I wanted to find a job that blended my previous experiences—technology and government—as well as provided new opportunities for learning. I first heard of Ushahidi while working for Google in 2010, and they had long been on my list of “dream companies to work for.” In the spring, I reached out to Ushahidi’s Business Development lead, interviewed, and received an offer. A few formals and five finals later, I found myself on a 16 hour flight to Nairobi. As an intern, I’ll be doing a combination of product management and business development, helping the company to monetize and think through feature development of a new mapping platform. I’m thrilled by the opportunity and the level of responsibility I’ll have. I’ll be spending the first three weeks in “The Bat Cave,” the unofficial name of Ushahidi’s headquarters in Nairobi, before heading to San Francisco to work closely with the company’s business development team. 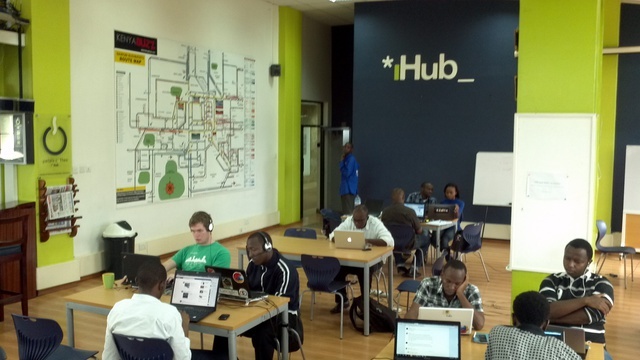 Beyond the internship, the environment is full of energy: the Nairobi office is located in the iHub, the heart of Kenya’s “Silicon Savannah,” and a nexus of African innovation and tech startups. With so much economic growth in Africa, a rising Kenyan middle class, and staggering levels of internet and mobile phone penetration relative to GDP per person (this is after all, the country that invented M-Pesa), it’s an exciting time to be in Nairobi. With the next three months stretching before me, the experience feels a bit like the Swahili word that Arab traders used to connote a long journey—a safari. I look forward to sharing a bit of my safari with you this summer!